It might now, strictly be 2015, but I’m ploughing on with my Album of the Year 2014 countdown. Thanks again, as always, for the continued support, the comments and the interaction. I hope you continue to enjoy my remaining posts in the series and if you’ve missed the preceding posts, links to these can be found at the bottom of this piece. 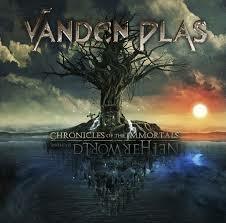 Vanden Plas are stalwarts of the progressive metal scene and at the very beginning of 2014, they released the massively impressive and grandly-titled ‘Chronicles of the Immortals: Netherworld’. I knew then that this was an album that would be in my top 20 come the end of the year and so it has proved. Rightly so, too. It’s clear that over the years, the band have become increasingly interested in the theatre, becoming more and more involved with stage shows and rock musicals. ‘Chronicles Of The Immortals: Netherworld’, however, takes the concept story idea to a whole new level and should put to bed all those negative comments about concept albums. In this case, the music on the album is based on a stage show that the band put together in conjunction with renowned German author Wolfgang Hohlbein and it’s really something special; even after a year or so of listening. In fact, like a fine wine, this is an album that gets better with age. In keeping with the stage show theme, ‘Chronicles…’ is split into ten Acts or ‘Visions’ with each one standing on its own whilst also playing an important and integral role in the album as a whole. One of the most instantly noticeable features of ‘Chronicles…’ is the recurring central melodic motif that flirts in and out of many of the tracks like a magnificent golden thread which is utterly beautiful and beguiling, only serving to underline just how impressive this album truly is. ‘Unlike many prog albums, ‘Chronicles…’ is also properly heavy. Unrelentingly powerful double-pedal drumming and monstrous bass work create an impressively strong framework upon which sit riff-hungry guitars that growl and shriek with real intent. The guitar tone throughout offers a satisfying crunch and the sparingly used lead runs are expertly crafted to provide that most metal of embellishments without detracting from the overall feel of the music. All of this is then wrapped up in some stunning keyboard and synth work, that adds depth, warmth and richness to the compositions. Always present, it is often subtle but comes to the fore when required, underlining that dramatic, filmlike feel to the vast majority of the material. With Vanden Plas, professionalism is built in and so once again, the quintet deliver a classy, vibrant and rather spectacular melodic progressive metal album. If you’ve never listened to this band, now’s a great time to remedy this enormous oversight.